It is hard to know what authors from the past had in mind when they wrote the words that we still pore over today. This is, of course, in part because it is hard to know what anyone "has in mind," and because it is hard to know what importance–if any–the intention of an author has for the ultimate meaning of a text. It is hard to know what authors from the past had in mind when they wrote the words that we still pore over today. This is, of course, in part because it is hard to know what anyone “has in mind” (including, as psychoanalytic theorists will remind us, ourselves), and because it is hard to know what importance–if any–the intention of an author has for the ultimate meaning of a text. But these large and complex psychological and hermeneutical issues aside, it is hard to know what, say, a late ancient Neoplatonist like Plotinus (3rd c.) had in mind when describing “the emanation of the One” for the simple reason that we can’t help but quickly turn his ideas into cartoons on the nearest marker board. Who among us has not, in their dealings with Plotinus or other ancient and medieval cosmologists, drawn either a series of concentric circles or a stack of parallel lines with a big downward-pointing arrow to help depict said thinker’s “cosmic layers”? Neoplatonists—and other cosmologists—of course invite this inasmuch as they take pains to describe “cosmic layers” and the relations between one “layer” and the next. But reading these “layers” as actual layers ultimately does us more harm than good in our attempt to decipher what these authors were up to. For more often than not, there is good reason to think that the cosmologist in question did not mean for his ideas to be taken spatially or temporally. Realizing this must of course temper the mood in which we approach our very spatial (often with temporal implications) drawings—as it must also temper our sense that our talk of the thinker’s “cosmic layers” (talk which fully verbally mirrors the pictures we have drawn) really tells us anything at all about what the author had in mind. In my book on 11th century Jewish Neoplatonist Solomon Ibn Gabirol (in which I myself draw a number of pictures), I refer to this as the error of reading an old cosmology as a set of archaic and arcane beliefs about a series of Invisible Kansases. To be sure, we quickly run into the vexing question of genre: What, we need to ask ourselves, makes us categorize one old text as “science,” another as “philosophy,” a third as “narrative, fiction,” a fourth as “narrative, historical,” and a fifth as “sacred text” (with further decisions on our part as to whether we describe said text as “theology” or “myth”)? Of interest too is the fact that, at different times and in different contexts, a text of cosmology might indeed qualify under any one or more of these categories. 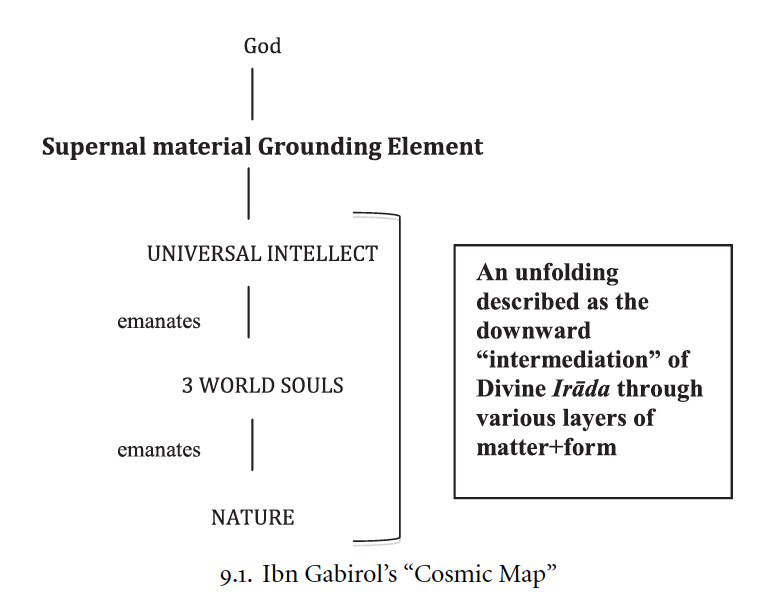 While we might classify contemporary cosmology under “science” (notwithstanding the scientific anti-realists’ request that we file it under “fiction”), we ought certainly not classify Ibn Gabirol’s or Plotinus’ Neoplatonic cosmologies as “science” (at least not in the sense in which contemporary scientists would understand that category). While Neoplatonic cosmology is a “science” in the literal, etymological sense of a collection of knowledge claims, it is misleading to read it in the same spirit as we would read a scientific book of geography or astronomy. The “cosmic topography” of Neoplatonic cosmology is obviously not the terrestrial or celestial topography of geography or astronomy (if one even understands astronomy that way); but it is also not even analogous to those endeavors—it is not as if geography is about Kansas and Neoplatonic cosmology about Invisible Kansas. 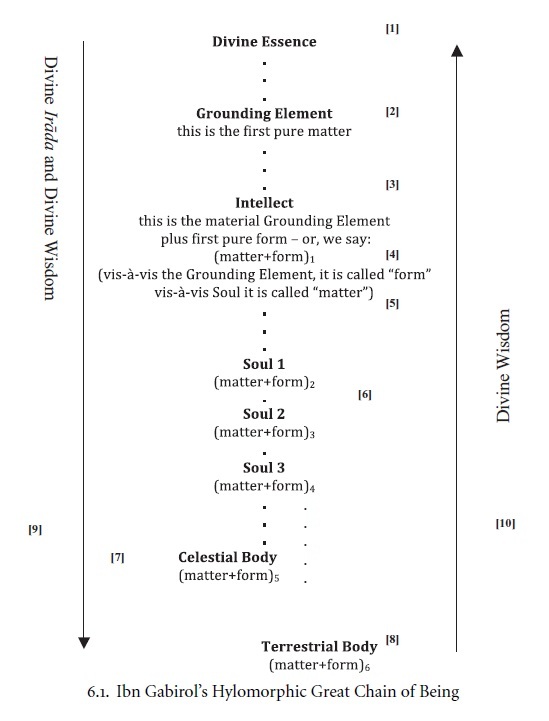 For every individual text of ancient or medieval cosmology, it is important to consider (1) the extent to which we might be reading it as “being about” Invisible Kansases (where the precise nature of the “Invisible Kansases” we treat ourselves to will vary from context to context), and (2) the extent to which said text is quite possibly not best interpreted that way at all. That is the hard part. 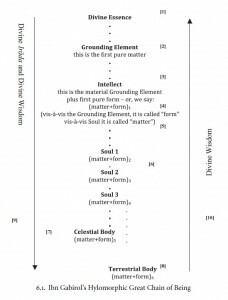 And then there is the even harder part: In cases where there is indeed reason to think that a cosmological text does not refer to some series of invisible, floating things, what after all is that text really “about”? While the answer to this question will likely differ from text to text, the complexity of arriving at the answer will not. In my study of Ibn Gabirol, I recommend approaching his Ps. 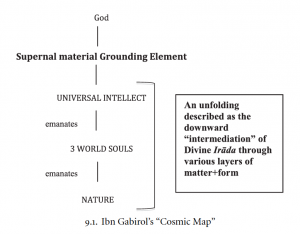 Empedoclean talk of “layers of cosmic matter” as a phenomenological-transcendental reflection on his part on the utter dependency and fragility of being and human being. But more important than my suggested answer is the methodological commitment to recognizing—and wrestling with—the question: While I am concerned to try to answer the question of what Ibn Gabirol’s particular cosmology “is about,” I am more concerned to encourage all of us wrestle seriously with the question—and to do so in our interpretive encounter with every text of ancient and medieval cosmology (and probably with any text that we find ourselves categorizing as archaic or arcane). While we might not easily (or ever) arrive at an answer, it is important that we at least acknowledge and wrestle with the question (and share with our students the requisite sense of disquiet that must accompany such wrestling) before we erase the neat concentric circles and downward-pointing arrows from our marker boards.